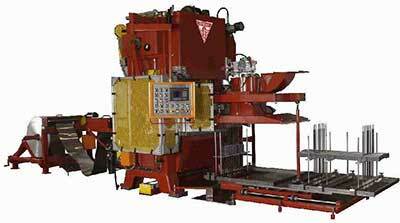 Tridan International offers a wide selection of fin press machines to choose from. Our fin press machines are available in a variety of press sizes. Also we offer accessories for your fin press. No matter the size of demand, we have the perfect machine for you. For large manufacturing jobs, our high volume fin presses are the perfect fit. Furthermore models such as our Fin Collector VC-3wp, the Fin Press HFP75 and the Fin Press RLC75F can handle the largest jobs. The HFP75 model combines state of the art guiding system with a traditional mechanical press frame technology. Our high volume fin press is designed to improve productivity for any job.